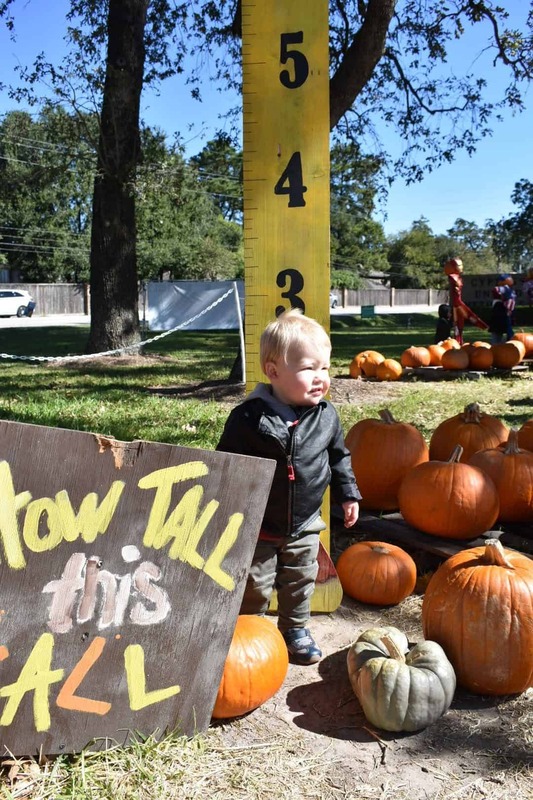 This weekend was the epitome of fall: cool weather, football, baseball playoffs (GO ASTROS), pumpkin patches, food, family, and friends. I have to be honest. Ever since we’ve moved to Houston, our new home just hasn’t felt as much like our home as our house in Dallas d]]><![CDATA[id. This weekend changed all of that. Nothing says HOME like fun in the fall. On Friday, we spent the evening outside and enjoyed the amazing weather that Houston’s been having. And no, you didn’t read that wrong. Houston has actually had AWESOME weather this past week. Fingers crossed it keeps up. 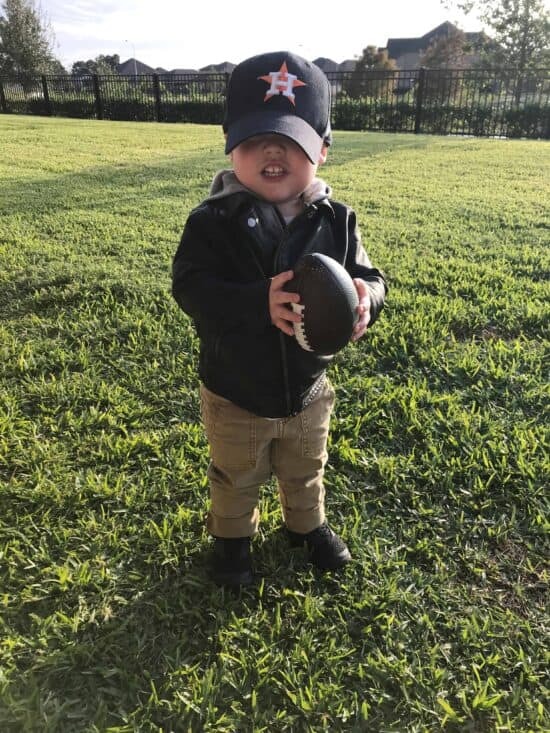 This little slugger was oober pumped to watch the Astros play again. He’ll tell any random person walking by, “GO ASTROS” with his fist pumping in the air. He’s got some blue + orange fever. I’ve had the urge to make Spanish Tapas at home for a looooooong time. Like over 5 years. Kinda sad that it took me so long, but it was worth the wait! My best friend and I used to go to a great place in Dallas for tapas when we had a girls’ night (before Corey – now we just stay in, order Mexican food, and fall asleep by 8). 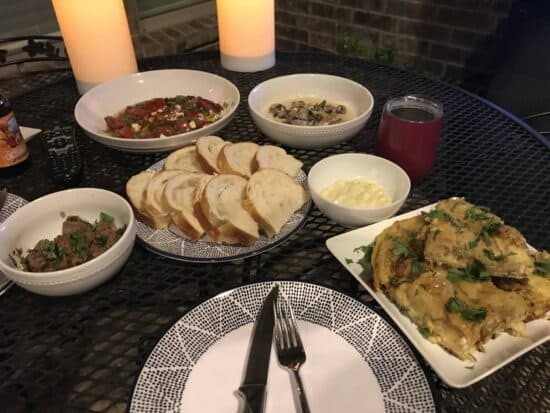 I tried to recreate some of our favorite dishes at home for Jon. Not exactly “baseball” food, but hey, what Mama wants, Mama cooks. I made: goat cheese stuffed piquillo peppers, mushrooms in a sherry-cream sauce, Spanish tortilla, aioli, and steak marinated in garlic and sherry. I’ll share some of the recipes later this week! Side note: if you live in Houston and know of a good Spanish tapas place, wouldjya share it? Saturday was Corey’s fall festival at his preschool. I can’t express how awesome it is to experience pumpkin patches, pony rides, train rides, and everything else that’s related to fall through my little man’s eyes. It makes everything so much more fun! I feel like I’m two sometimes, too. 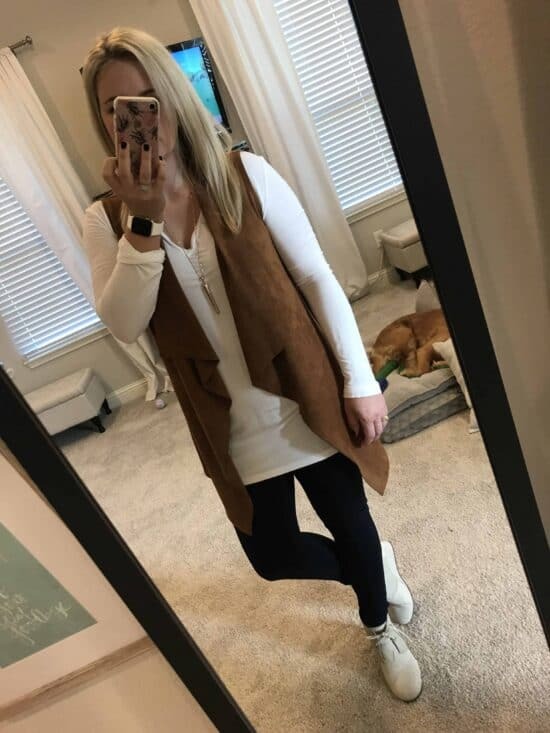 Since it was pretty chilly outside, I FINALLY got to wear my camel vest I’ve been saving! It was just heavy enough to keep me warm while we were outside all day, but still looked friggin adorable. Gotta love Magpie’s! Gah! This could’ve been the official Christmas card pick if only little man would’ve cooperated. Oh, you better believe I’m getting a picture just like this one every year. 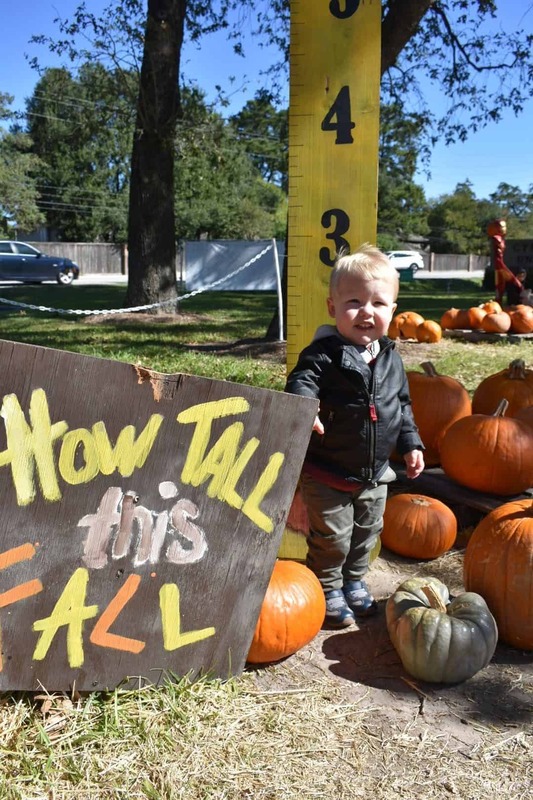 “How Tall This Fall” – I see what you did there. Making me get all Mama Emotional in the middle of a pumpkin patch. This fool has only one direction in cozy coupes: backwards. Heaven forbid he gets stuck. There is zero forward motion for this reckless driver. That jacket though… Cat & Jack at Target is my jam. You better believe that the whole time little fella was riding that pony, he was NEEIIGGGHHIIINNNGG! We hosted some of our family and friends on Saturday night to watch the Astros play (and lose – GAH!). I don’t know what it is about the fall, but it makes me want to do nothing but make way too much food and have folks over all the time! We decided to keep it simple and do burgers, salad, and Corrales Casserole (recipe coming soon). 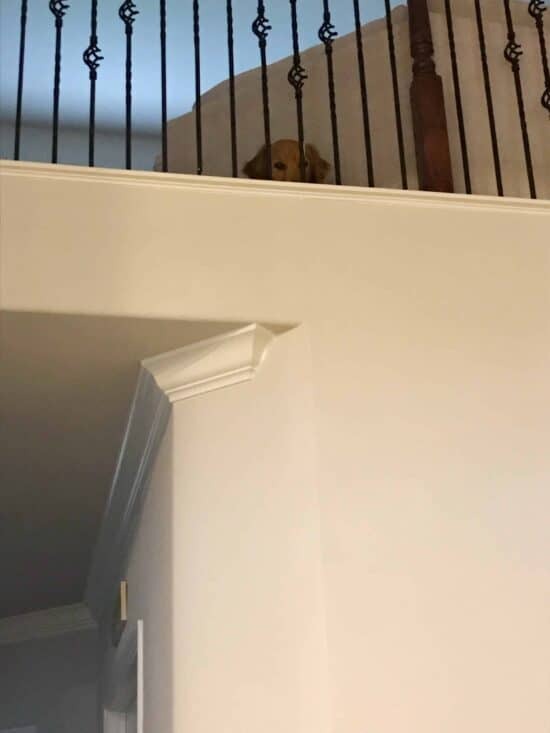 Penny the Creeper was supervising while I cooked. I made a little salad “bar” with diced tomatoes, real bacon bits, and a homemade blue cheese dressing. I like serving salads in a bar-type style because lotsa folks like lotsa different things on their salad. I know Jon Boy doesn’t do anything besides lettuce and dressing. Others love every kind of vegetable you can imagine. So, by serving it up bar style, the lettuce doesn’t get soggy PLUS you can let your guests customize it all. Here’s how I made the bacon bits + homemade blue cheese dressing. Place bacon on oven-proof racks on a baking sheet covered with foil or a cooking mat. Roast bacon at 375 for 25 minutes, or until crispy. Remove bacon from oven, leave on racks, and cool completely. Crumble with your hands as much as you can, discarding any pieces that are too fatty. Whisk everything together in a large glass bowl until well combined, making sure there aren’t too many big chunks of blue cheese. 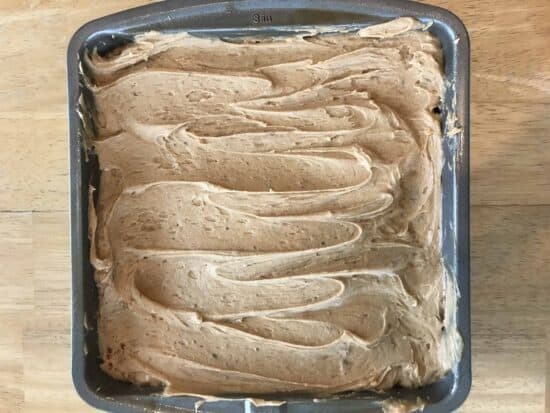 Cover with plastic wrap and refrigerate for at least an hour and up to a day before serving. I hope your weekend was full of some fall goodness. Cheers to Sunday and the ASTROS! Did I mention we’re fans?